Measuring your windows to decide which size of curtain to order is easy. Just follow these simple steps on how to measure your window for your curtains. We always advise that you measure the curtain track or pole width, not the window. If you are fitting a new track or pole this should extend 15cm to 20cm either side of the window. This will allow the curtains to be stacked either side of the window. Curtain Poles: Measure the length of the pole between the finials (decorative ends). 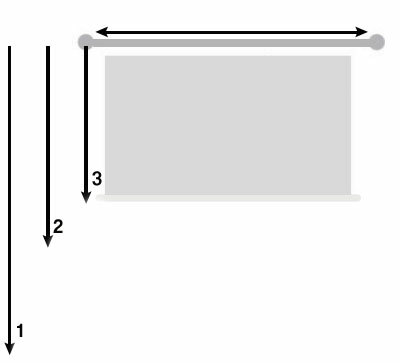 Curtain Rails: Measure the length of the rail. If you have a rail with an overlap in the centre, measure the length of the rail and add the length of the overlap to this measurement. Above radiator typically 1 to 3cm above the radiator. Below the window sill typically around 15cm. Tab Top & Eyelet Curtains: For Tab Top or eyelet curtains you should take your measurements from the very top of the pole.